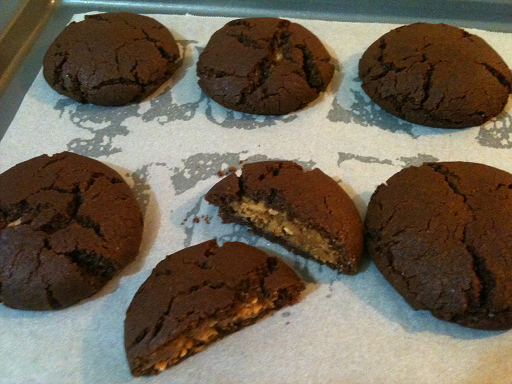 Now this Chocolate peanut butter cookies recipe was actually a different recipe which didn't work out as meant to. They are the pillows recipe but mine came out differently! I guess that is what happens when you change around ingredients. But's it's okay because the pillows are now Chocolate Peanut Butter Cookies which are tasty and very delicious. This recipe it totally lactose free and the cookies come out crisp and very tasty. In a large mixing bowl combine oil, sugar, honey, rice or soy milk and vanilla essence and mix until smooth. Sift in flour, cocoa powder and bicard of soda and salt. Mix to form a moist dough. To make the filling in another bowl beat together peanut butter, icing sugar, 2 tablespoons of soyr or rice milk and vanilla essence to form a moist but firm dough. Preheat the oven to 175C (350F). Line trays with baking paper. STart by rolling the filling into about 24 small marble sizes balls. Then take a tablespoon of chocolate dough, flatten into a disc and place a peanut butter ball in the center. Fold the sides of the chocolate dough up and around the peanut butter center and roll the chocolate ball into an smooth ball between your palms. Place on lined baking tray and repeat with remaining dough. Place dough balls on lined baking sheets about 5 cms (2 inches) apart and bake for 20 minutes. Allow cookies to cool on a tray before moving to a cooling rack. I had a lot of watermelon left over and was worried it was getting overly ripe so decided to make some refreshing watermelon sorbet. 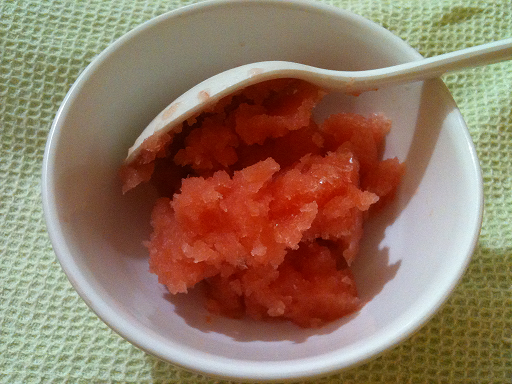 A quick Google search for a watermelon sorbet recipe found this delicious treat with a few changes. Chop up watermelon into small pieces then use a blender to puree it. In a small saucepan bring ½ cup watermelon puree, lemon juice, zest and raw sugar to a simmer and remove it from the heat. Allow mixture to cool for 20 minutes. Add the lemon and watermelon mixture to the rest of the pureed watermelon and mix well. Place mixture into an ice cream maker and freeze according to manufacturer’s instructions. I found this divine Chicken Madfoun with Vemicelli and Almonds recipe in the wonderful cook book A Month in Marrakesh by Andy Harris. This cook book has incredible recipes with the most amazing photos that transport you back to Marrakesh. You feel as if you are there. That is what attracted me most to this book. I have cooked a few recipes from the book and have been waiting for the opportunity to cook the Chicken Madfoun and it won't be the last. 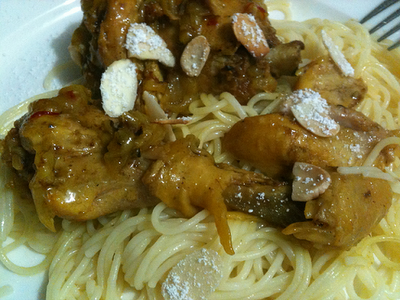 I really love vermicelli, they are lovely thin like noodles that go perfectly with this dish. I am sure you are also wondering about the icing sugar. Please make sure to sprinkle it on. It will be missing something if you don't. Be adventurous. I am sure you will absolutely love this dish as much as I.
I used my tagine but you can also use a casserole dish. Heat half the olive oil and margarine over medium heat in a tagine or casserole dish. Add the onions and sauté for 5-7 minutes until softened, then transfer to a bowl. Add the chicken pieces to the tagine and sauté for 5-7 minutes until browned. Return the onions to the tagine and add ginger, saffron, ground cinnamon and enough water to cover the chicken. Season generously with salt and pepper. Bring to the boil. Reduce to a low heat, cover with the lid and simmer for 1 hour. Meanwhile cook the vermicelli in a saucepan of boiling salted water around 8 -10 minutes or until cooked. Drain and mix with rest of margarine and olive oil. Toast the almonds in a small dry frypan. Take the lid off the tagine after 1 hour and cook for a further 15 minutes or until the chicken is tender the onions are almost melted and the sauce has thickened. Transfer vermicelli to a platter or onto plates. Arrange chicken and onions on top and spoon any remaining sauce. Sprinkle slivered toasted almonds, icing sugar and cinnamon. I was reading the paper on Sunday and came across this Anzac Biscuits recipe in the paper. It is a Donna Hay Anzac biscuits recipe but I have altered it to suit those of us who are lactose intolerant. Actually Donnas’ recipe requires two Anzac Biscuits to be sandwiched together and filled with a caramel filling which you just buy in a can from the supermarket. You can do that too but I decided I didn’t want the extra calories! The flavour in these biscuits is all there, they are really easy to make and they taste as delicious as ever. Make sure you keep the oven at 160C the whole time as the Anzac Biscuits need a low oven temperature to cook them without burning as several trays will go in and out constantly. 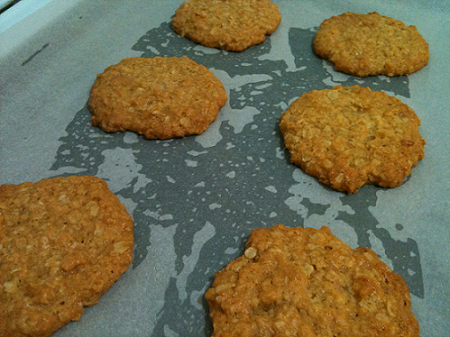 Make sure once you take the Anzac Biscuits out of the oven that you leave them to cool on the tray as they will be soft. Put in the next batch of biscuits. Then once it’s time to take those out then you can take the cooled biscuits off the tray and onto a cooling rack to cool completely and put your next batch on that tray. Biscuits made in honour of the ANZACS for Anzac Day the 25th of April. Place the oats, flour, sugar and coconut in a bowl and stir to combine. Combine the margarine and honey in a small saucepan over low heat and stir until the margarine is melted. Mix the water and bicarbonate of soda in a small bowl. Add it to the margarine mixture and stir to combine. Pour the butter mixture over the flour mixture and stir well to combine. Place ½ tablespoons of the mixture onto baking trays lined with non-stick baking paper allowing room to spread. Flatten slightly and bake for 10-12 minutes or until golden. REMINDER: Leave biscuits to cool on tray because when they come out of the oven they are still soft and need about 10 minutes to harden up. I found the Cauliflower Soup recipe which is the foundation to this recipe in a wonderful cookbook called The Soup Cookbook. I then added a few different veggies as they were in my fridge and wanted a bit more flavour then just cauliflower. This recipe is so simple and easy to make and is lovely and velvety in consistency and tastes like melted butter in your mouth. I highly recommend your try it. It's so easy I promise. Heat the olive oil in a large saucepan and cook the onion, zucchini and red capsicum stirring frequently for 10 minutes taking care not to allow the vegetables to colour. Cut the cauliflower into florets and cut the stalk into small pieces. Add to the pan and sauté with the other vegetables for 2-3 minutes. Add the stock and bring to the boil, then cover and simmer over a medium heat for 20 minutes. Remove the soup from the heat and leave to cool slightly. 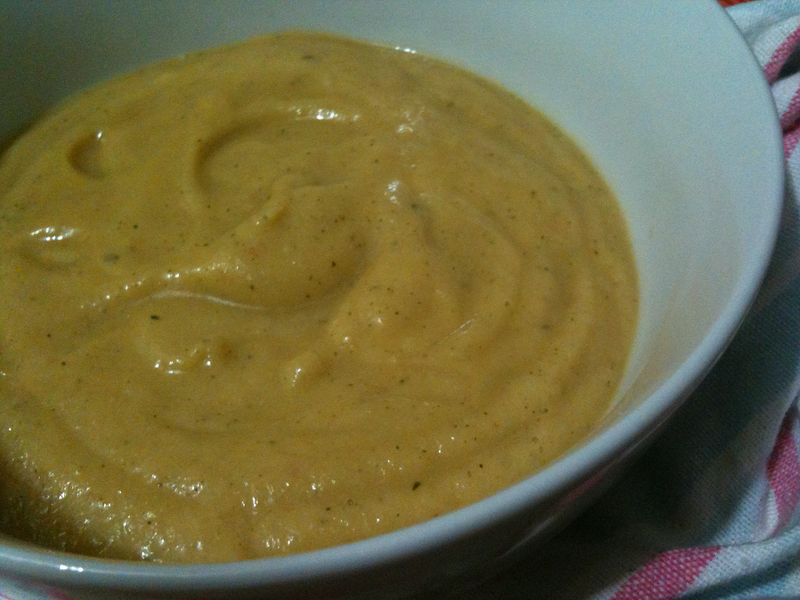 Transfer to a food processor or blender and process to a puree in batches if necessary. Taste and adjust the seasoning, adding rock salt and cracked pepper. This homemade ravioli recipe is another recipe I got from one of my favourite cook books A little Bit of This, a Little Bit of That from the winner of Junior Masterchef Isabella Bliss and her family. Pictured above is the delicious end result this homemade ravioli recipe will create. So easy and so satisfying to know you made something so wholesome and divine. Place the flour, eggs and olive oil in a medium bowl and mix together using your fingers until a dough forms. Turn out onto a lightly floured surface and knead for 5 minutes or until the dough reaches an elastic and smooth consistency. Wrap with cling wrap and set aside to rest while you prepare the filling and until you’re ready to make the pasta sheets. For the prawn filling, place all the ingredients in the chopper attachment of a stick blender or in a food processor and blend until the mixture forms a paste. Set aside. In a blender add all ingredients and blitz. Then set aside. To make the pasta sheets, divide the dough into two equal portions. Take a portion, dust with flour and roll through the widest setting on your pasta machine. Reduce the width between the rollers by one and roll the dough through as before. Repeat the process; adjust the roller width each time until you reach the setting six or seven. If you don’t have a pasta machine just use a rolling pin and roll out thinly as possible - about 2mm. To make the ravioli use a 4.5cm crinkle cut ravioli cutter. Place a heaped tablespoon of the prawn filling in the centre of one round, lightly brush the edges with water using a pastry brush, then top with a second round. Press the edges of the ravioli together to seal. Repeat with the remaining rounds and filling. Place a large pot of salted water over a high heat and bring to the boil. Cook the ravioli, two or three at a time until they float (by this time, the past should be al dente and the filling cooked through – this takes about 3-4 minutes. Drain well. Then pour pasta sauce over homemade raviolis and season to taste with additional salt and freshly ground black pepper. 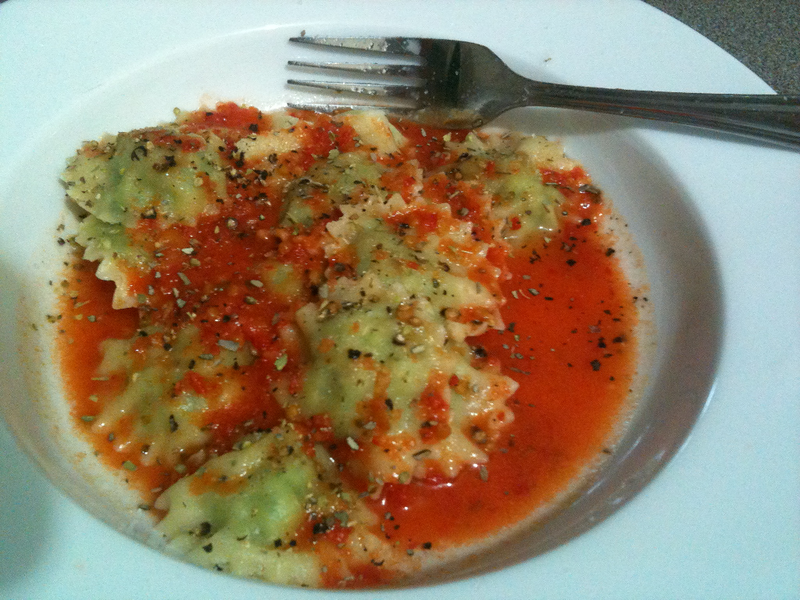 Enjoy the easy and delicious results from this homemade ravioli recipe! 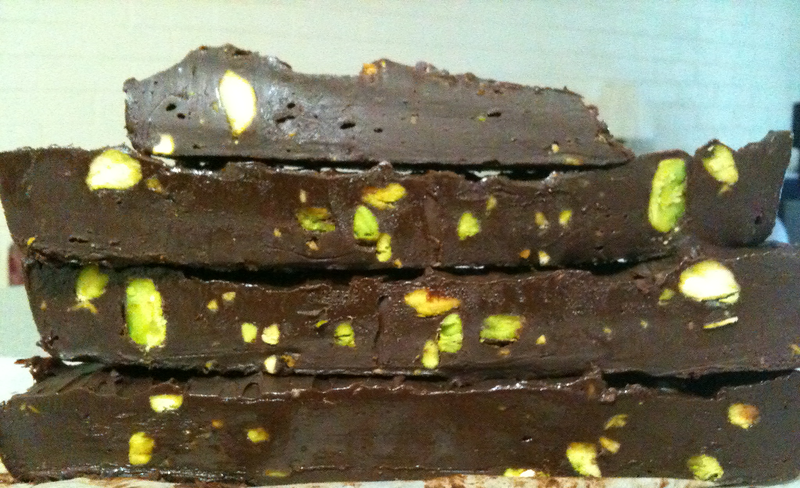 This wonderfully decadent recipe for Chocolate Pistachio Fudge was found in the cookbook Nigella Express which I recommend highly as it has some great recipes you can make quickly hence the title Express! Anyway I decided to make this recipe because the photo looked amazing and it’s fudge! I also decided to make it because the chocolate used is 70% cocoa which means it doesn’t have as much milk as normal chocolate so it is not so hard on the tummy and also dark chocolate is good for you so think of all the anti-oxidants as you are chowing down on this as you won’t be able to stop. It is that wickedly good! Put the chopped chocolate, condensed milk, margarine and salt in a sauce pan on low heat and stir to melt. Put the nuts into a freezer bag and bash them with a rolling pin until broken up into pieces. Add the nuts to chocolate mixture and stir well to mix. Pour the mixture into a tray 23cm square, smoothing the top. Let the fudge cool, and refrigerate until set. Once cut, it can be kept in the fridge until you eat it all! This is a very easy homemade pasta recipe I got from the wonderful cook book, A little bit of this, a little bit of that by Isabella Bliss the winner of Junior Masterchef with her sister Sofia Bliss and mother and grandma Sylvana & Nonna Spina. I love any cookbooks that have recipes handed down through the generations and this cook book is a treasure trove of recipes passed down from many generations. I will post a few more recipes from this book but for starters lets keep it simple and let me show you how to make freshly made past from scratch first. Place the flour, egg and olive oil in a medium bowl and mix together using your fingers until a dough forms. Wrap with film and set aside to rest for 30 minutes. To make the pasta, divide the dough into two equal portions. Take a portion, dust with flour so the pasta doesn't stick to the rollers and roll through the widest setting on the pasta machine. Dust the sheet again and pass through the pasta machine reducing the width between the rollers by one. Repeat the process by adjusting the roller width each time until you reach the setting six or seven. 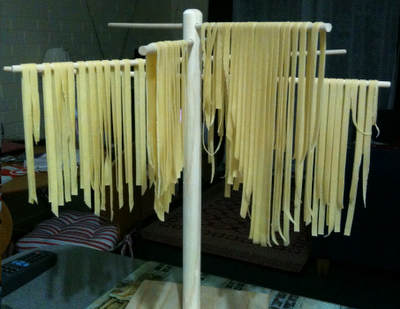 If you don’t have a pasta machine just use a rolling pin and roll out thinly as possible until about 2mm. Then put the pasta through the rollers for fettucine and place cut pieces on a pasta tree to dry. Then to cook simply place a large pot of salted water over a high heat and bring to the boil. Cook the homemade pasta for one to two minutes by this time the pasta should be al dente and ready to serve. And this is how to make pasta. So easy! I was watching Hugh from River Cottage cook this delicious Blueberry Clafoutis and thought yes I have to make it! I love watching the program because it is so homey and I love Hugh's voice, I find it soooo soothing. He made this look so easy to make and easy is my specialty so I gave it a go. The first thing I did was to buy a quiche dish which was extremely difficult to find because a 25cm dish was what I needed yet I couldn't find the size. I ended up heading to David Jones and found a white ceramic one from Maxwell & Williams but on the box it said 28cm. I had a ruler with me, because I was getting desperate at this stage and needed the dish this day as I was making the Blueberry Clafoutis for the following day so double checked the measurements. Well it turned out it was actually 25cm inside and measuring from edge to edge was a little over 26cm which was very misleading. Anyway I was ecstatic so snapped it up and off I went to get cooking. I have changed the recipe a little by substituting the full cream milk with a lovely thick and creamy soy milk from So Good. The flavour was not compromised as it was wolfed down by everyone at the picnic and was told by one that I was welcome to come on many more picnics is if I was going to bake like that! High praise indeed. What is clafouti? You maybe be wondering what this dish is. Well it is from the Limousin region of France and is a baked custardy treat filled with a fruit of your choice. In this instance it is blueberries but more traditional is either cherries or plums but you can use anything you like. Preheat the oven to 180ºC. Lightly butter a 25cm quiche dish with a milk free margarine then tip blueberries into the base. Scatter lemon zest, juice and drizzle honey over the berries. Whisk the flour and caster sugar together then form a well in the centre of the mixture and add the eggs. Gradually draw the the flour into the eggs from the outside of the well, mixing well. Then beat the soy milk in a little bit at a time to form a smooth batter. 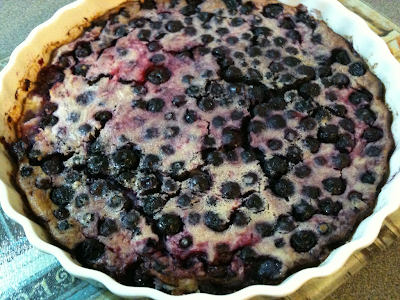 Pour the batter over the blueberries and bake for 35-40 minutes until golden and puffed up. Serve clafouti warm or cool and dusted with icing sugar if you choose.